First I have to say I cannot believe you are 3 years old today. I know that sounds so cliche. Everyone says that and it had always previously gotten on my nerves. I mean, how can someone not believe it, it's true, they watched it happen. 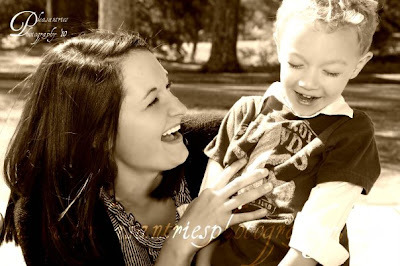 Even though I know that I can't help but think- I can't believe you are 3!! You are such a sweet and loving little boy. 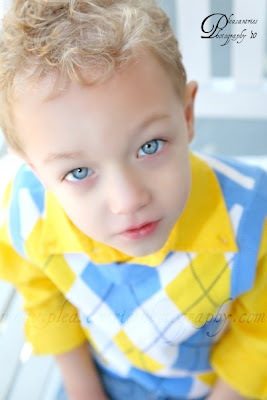 You have the most beautiful blue eyes that get noticed everywhere we go. People always stop and comment on how gorgeous you are. 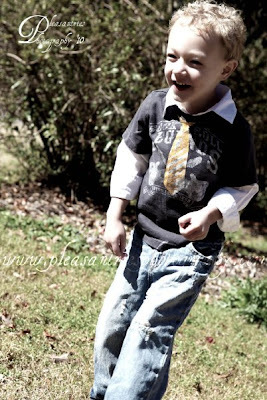 Usually not a word to describe a boy but you really are the most handsome little boy I've ever seen. Your laugh is infectious. I can have the worst day and come home and hear you laugh and it's like God wiping my day clean. That is probably the thing I love the most about you, your laugh. The way it lights your whole face up and makes your dimples shine just makes my day. You are recently developing more and more of a personality and we can't seem to figure you out! Some days you are loving and kind and some days you are whiny and mean. Maybe that's the boy in you?? You are definitely becoming more and more a mommas boy to. You want me to do everything for you. I thank God for you everyday. I pray for you so much, that you will follow God's will for your life. I pray for your future wife and hope she likes me! (I know that's selfish but everyone knows how boys can be when they are older!) 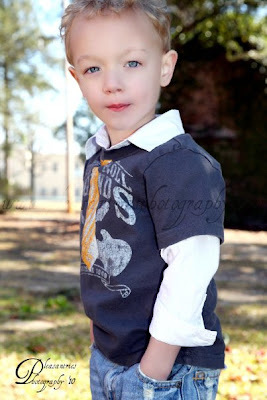 I pray that you will grow into a strong, handsome, confident, well adjusted, loving, hardworking, christian man. I just want you to know how much you are loved. Believe me it's more than you will ever know. I know though, no matter how much I love you, God will always love you more. Which blows my mind. So I pray that God will use me and your dad to make you into the man he wants you to be. I pray that we won't take your childhood for granted and will enjoy all the little moments. You are growing up way to fast and as sad as that makes me, I can't wait to see what the next year has in store for you. Two big events you have this year will be school and tball. I can't wait to see how you do with those!! Happy 3rd Birthday Tanner!! We Love You So Much!!!!!! Saturday was one of the best days we have had in a long time. Ryan is still working weekends (which isn't fun) so we decided to meet mom at Cottage Hill Park. Well what started out as us and mom turned out to be the whole family! It was such a fun day!! All the aunts put together a picnic lunch. Of course, it wasn't just sandwiches it was a full spread of food. It was insane! Look at the cute twins! They look just alike! They wouldn't take a good picture together. Take notice of how Jordan's knees touch the ground and Whiteys are almost a whole foot of the ground! Poor thing, she's so short! They went round and round on this tire swing. I really thought Tanner was going to throw up! Here is Whitney trying to jump the fence after I did. Obviously she forgets how short she is! Morgan, Carlee and Ryleigh. They are such cute little girls! After we ate, played on the playground, ran, played soccer, played tball, rode scooters, ate some more and played some more we went to play tennis. It was a lot of fun. I had never really played before. Mom used to play back in the day! She thought she was Venus Williams out there! : ) Seriously though, she was pretty good! Whitney and I look like pros! Ryleigh would act like she was hotting the ball but all she'd really do was throw it over and swing her racket at the same time! After tennis we got ice cream from the ice cream truck. Then Larry called and we had to leave. Mom can't be away from him for more than 2 hours at a time! just kidding...well sort of! We really did have the best time that day. We stayed at the park from 11 to almost 3:30! It was so fun to just hang out and have no real plans and just play all day. It's days like today that make me so thankful for our family. I love how we can turn a spontaneous day at the park into an entire event. So it hasn't snowed in Mobile and actually stuck to the ground in like 15 years. Well last Friday that all changed! We had snow and it decide to stick around for a few hours! At first when they said it was going to snow I didn't really want it to. I knew the banks wouldn't close and I didn't want to have to go to work in the snow! Well, the banks didn't close but they told me not to worry about coming in since we lived so far out and it was already snowing at our house. So I got up and put on a big pot of soup and waited for the snow! Around 10 it was still snowing but enough had fallen and stuck that we could go outside and play in it. Ryleigh and Tanner were so excited! Look how much snow we had! We didn't have any water proof gloves for the kids so we just put on their regular gloves and and then put doctor type gloves over them. It worked pretty well. You can't even see Tanner's face in this picture. He was all bundled up! Our fabulous snowman!! Or I guess I should say snowwoman! Ryleigh made snow balls and carried them around in her Easter basket. Tanner though it was hilarious so knock over her Easter basket! It was such a fun day! We just hung out and played all day. Once we were finished playing in the snow we went to Moms and she made homemade hot chocolate. Then everyone came to our house to eat potato soup. We thought we would take a nap and then go back outside and play but once we woke up the snow was completely gone! It was actually kind of weird. Last night when Ryleigh was saying her prayers she said "Dear Jesus, thank you so much for that very fun day you gave us. Remember, the snow day? Yea, I thought you'd remember because it was so much fun! Can we please have another one? Thank you, amen!" This past Saturday we signed Tan Man up for T-Ball. He is so excited about playing! Technically you are suppose to be 4 or 3 turning 4 sometime during the season. Well Tanner is 2 turning 3 during the season but they didn't say anything when I registered him. Probably because he was the biggest kid in the room. He was way taller than every 4 year old there. We went to Academy and got all the things he would need to start practicing at home. (Just and FYI, T-Ball isn't cheap!) Ryan was very upset about the glove we had to get him. When we were looking at the gloves Ryan found a Nike T-ball glove he wanted to get him. I was thinking Ryan needs to get less expensive taste! He then noticed that the glove was for right handed people and Tanner is left handed. (I don't know if I'm saying that right or not all the right handed, left handed stuff confuses me in baseball. But whichever one he is its the one that isn't common and they make a lot more money! : ) Or at least that's what I'm told.) So when we go to look at the gloves for the left handed kids, there is one glove for Tball. Just one. It's a Rawlings. Then on to the bats. The first one Ryan picked out was a Nike bat. It was really cool looking, it was red and orange and Tanner really liked it. Not to bad I thought. Well at least until some baseball know-it-all that was standing beside us said that Tanner would need to hold that bat straight out with one hand. If he couldn't then the bat was too heavy. Well the Nike bat was too heavy. It weighed 13 pounds. I was thinking oh good we can get a smaller bat and it'll be cheaper! Yay! Well just another FYI for ya, the lighter the bat the more expensive it is. The new bat we found that weighs almost 11 pounds was $40!! That's insane! We then went to get cleats. We are a Nike family. I don't know what the main reason is but we are just brand loyal. All my running stuff is Nike (except my shoes, my heel is to tall for Nike tennis shoes. I know it makes no sense!) I just like their brand. They've been around for awhile and they aren't crazy expensive and you can normally find a lot of things on sale. Unlike my enemy The Under Armour! When we were looking at cleats the only kind that were in Tanner's size were Under Armour. With their to high price tag and goofy logo. I drew the line there. I refuse to pay under armour price for a pair of size 10 toddler cleats! I'm hoping I can look around and find some more. But, Oh Nike how you let me down on our trip to Academy. We walked away with a Rawlings glove, a no named bat and no cleats. I need to right a letter to their corporate headquarters. Please get your act together. We have been a purchaser of your brand for years and most recently I'm sure you have seen an increase in your sales due to my family and our array of sporting activities we are currently participating in. For example, running, biking, dance and TBall. And now thanks to you my son has to go to Tball practice with mismatched brands and sporting equipment that is not up to par with the products you offer. Oh and why I'm at it please also make the heel of your tennis shoes deeper. I like to think that his hair really didn't look like that all night and it was just the wind blowing it over to the side that resulted in him looking like Donald Trump. Never mind the fact that we were inside when I took the picture! ...no matter how old I get it never gets old calling Velvet "Beater Weater Pumpkin Eater!" I'm glad I taught it to the kids to! ...nana moved up about 1,000 points on the cool scale once Ryleigh and Tanner discovered she has a Nintendo DS. ...Jordan had some awkard baseball pictures taken when he was younger. Evan was sure to point them out! ...speaking of them, if they get any taller Velvet is going to have to build a new house with 16 foot ceilings that they can fit in! ...for his birthday Tanner wants a 4-wheeler. A spiderman 4-wheeler, a black spiderman 4-wheeler. ...odds are, Evan will be sick tomorrow and miss school from running outside in 20 degree weather...barefoot!! ...it also looks like Ryleigh may be developing Evan's behavior when it comes to school...please no!! ...Velvet is officially Miss Skinny Minny. Maybe we'll change from beater weater pumpkin eater to Miss Skinny Minny...nah! ...Ryleigh got her mothers enthusiam for singing. Unfortunately for her she also got her mothers lack of ability to sing, without making your ears bleed! ...Ryleigh also taught Nana the "Church of God" way to sing. With your hands raises high! We stopped by there tonight on our way home from church and the boys and Velvet walked over to. I love nights like tonight. When we just hang out and goof off! Wesley (our cousin) keeps his horses in dad's barn. He has 2 maybe 3 horses. Well for what seemed like months he has been saying that one of his horses is pregnant. Ryleigh and Tanner were so excited at first but since it's been such a long wait their excitment had fizzled. Monday on my way home mom called to tell me that the horse had her baby! When I got home I told the kids to get dressed and we had a surprise for them. They had no idea what it was. I think they had actually forgotten about the horse that was suppose to have a baby. When we got to the barn they were so excited!! Here is the baby horse. It's a boy. Tanner was quick to make the observation that he had really long legs. I said they're long like yours. He said "Mom, my legs don't look silly like his!" See how happy they are! They tell everyone that it's their pony. So now all our friends think we've bought them a pony. I wish it would have waited a little longer and we could have pretended it was their birthday present! I'm not sure what Wesley is going to name the pony. But since Tanner "thinks" it's his pony he named him Gumball! So at our house that's what we call the cute new pony. So I made the BIG mistake a few months ago of telling my friend Katrina that I would teach the 2 & 3 year Sunday School class. She teaches it every Sunday and was kinda getting burnt out on it. I felt bad because Ryleigh and Tanner are both in the class. Just let me reinforce what everyone probably already knows. I was NOT called to serve in children's ministry. AT ALL. When I agreed I thought its only 45 minutes one Sunday a month. It can't be that bad. Oh, but it is. First off Ryleigh and Tanner are EXTREMELY clingy when we are in there. I guess it's with all the other kids they feel jealous. Secondly, I know 45 minutes doesn't sound like a long time but when you are entertaining young kids it is! Here we playing a game I made up. Each time we make a lap around the room the next kid in line goes to the front and gets to pick what we do for another lap. Such as run, jump, hop, dance, wiggle ect. They really liked it and it kept them entertained for awhile. Thank goodness Ryan was there to help me! He is great with kids! I got to work this morning and I pulled up our checking account online since Ryan gets paid on Fridays...and someone had stolen our debit card info!!! They made $1800 worth of charges in California and New Jersey! I was so frustrated! Mom said it's God teaching me compassion. Normally when people come into the bank with that problem I just tell them to call the 1-800 number and that's it. I don't offer to hear their story or let them vent, because I don't care. And it's not that I don't care about the person I just don't care about the problem. Well, I guess that would mean I didn't care about the person either. I don't know. Ryan gets mad at me about this quite often. He is one of the most compassionate people I know. It frustrates him to no end that I'm not. We had to take Spiritual Gifts test at church to see what area we are gifted in. I think there are 5 areas. Well no surprise I scored the lowest in Compassion and the highest in Administration (organizing events, keeping up with things, and coordinating people.) Ryan scored the highest in Compassion. This is proof to what I said before, we make a good team! The first thing I did after calling to cancel the card was call my mom to "vent." There wasn't anything she could do to help me. I just wanted someone to listen and be compassionate about the situation. I guess now I'll be more sympathetic to customers when this happens to them! Next time God wants to teach me a lesson, I wish he wouldn't take such drastic measures! Or maybe he's been trying to teach me compassion all along and I'm just to stubborn to listen. I guess he knows it's go big or go home when your trying to get something through my stubborn head! Happy birthday to our 2 favorite Lindse(a)y's!! Our cousin Lindsey turned 26 on Saturday. Man she's getting old!! Aunt Lisa had a party for her Saturday night. Tan and Ryan were hunting so just Ry and I were able to go. I know this sounds dumb but I cannot believe she's 26!! That means I'm going to be 24 this year! Ryleigh with the birthday girl and her delicious cake!! On a complete side note; Monday morning I get in my car and there is a container full of chocolate cake cupcakes. I didn't know where they came from. Once I started down the road I got my phone out and saw aunt Lisa had sent me a text. The cupcakes were from her house. She put them in my front seat on her way to work to get them out of her house! I told her I didn't want them in mine!! I'm ashamed to say I've had 4 of them. Thanks for the 10 extra pounds Aunt Lisa! Our second Lindsay party was Tuesday night for a good friend of ours. We went to shogun. It was so good! Ry and the birthday girl! This is a terrible picture but the story here is that Tanner propsed to Lindsay! The night before Ryleigh was talking about wanting to marry Austin (Gills Nephew). Tanner then said who am I going to marry? Ryan and I rattled off a few names of girls his age and he said no to all of them. Then out of nowhere he said "I know, I'm marrying Lindsay! We have the same name!" 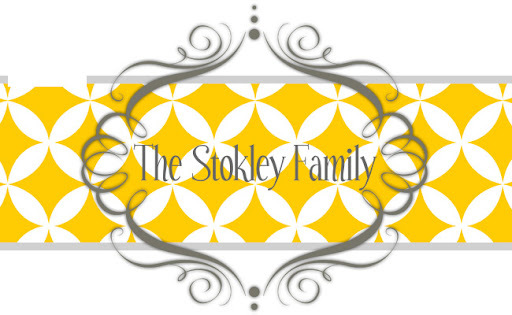 (She's a Stokley). So for her birthday he got one of Ryleigh's rings and wrapped it up. When she opened it he said "Will you marry me?" It was so sweet! She said yes and then he got upset that she didn't have a ring for him!! So not only do they have the same name, birthdays that are close together but also they are both engaged!! Congratulations girls!! We love you both! I may have never killed a deer but at least I know how to look the part! And did I mention that it's freezing, boring and you can't talk!! Hunting is NOT for me! I enjoy the time I get to spend with Ryleigh by ourselves since he always takes Tanner with him. He says Tanner is a much better hunting partner!